Mangaluru, June 13, 2018: The Mandarti Yakshagana Mela, run by the Sri Durgaparmeshwari Temple at Mandarti in Udupi district, will be holding its “harake aata,” or Yakshagana shows performed for the fulfillment of vows, during the monsoon for the second successive year, from June 17. Five troupes of the mela perform during the summer and they used to shut down their performances during the monsoon till 2016. Tradition : Such is the demand for the “harake aata” that they are booked till 2040-41. However the tradition of not performing in the monsoon was broken last year due to pressure from devotees who felt that they had to wait for years for the shows. Bowing to this demand, the temple management held 98 Yakshagana shows during the monsoon in 2017. However, this year, the temple management has permitted two of its troupes to give performances. “Each of these troupes will perform 150 Yakshagana shows thus fulfilling the demand of 300 devotees. The shows would be held from 7 p.m. till midnight,” H. Dhananjaya Shetty, Managing Trustee of Sri Durgaparmeshwari Temple, toldThe Hindu . The troupes will perform shows at the temple hall at Mandarti, about 26 km from here. The two melas would have 25 to 35 artistes each. This is less than the usual as there was no need for the additional staff during the shows in the monsoon as they are held in the hall. The shows held during monsoon would wind up on November 1 or 2, this year. After a break of about a fortnight, the five trouples of the mela would begin giving Yakshagana performances from November 17 or 18. 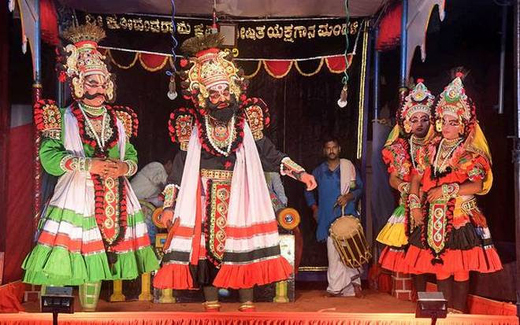 “We have already been telling devotees complaining of a long waiting period to opt for the Yakshagana shows during monsoon as their demand would be met within a year or two,” said Shetty. Meanwhile, the Yakshagana shows to be held during the monsoon this year (2018) are fully booked and the shows for the monsoon next year too are nearly full.